The stunningly brand new, 5 star Sheraton Nha Trang Hotel & Spa is located in Nha Trang City, on the east coast of Vietnam. 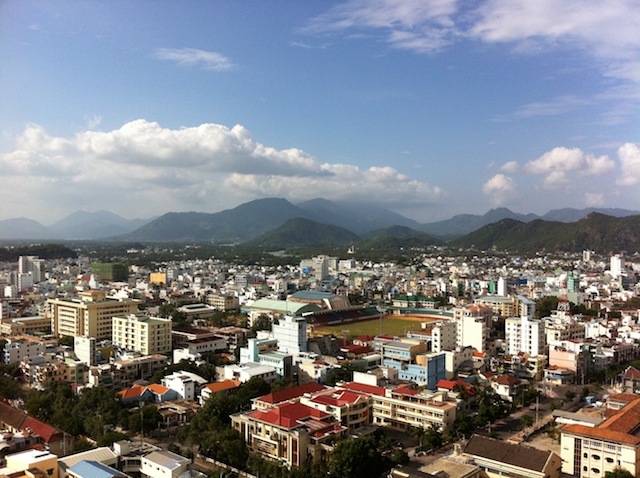 The hotel is a convenient taxi ride away from Nha Trang Airport, and is overlooking Nha Trang Bay (hailed as one of the most beautiful bays in the world). Upon arrival we were welcomed with gracious Vietnamese hospitality. And since we are Starwood Preferred Guests, we were upgraded to a fabulous room on their Club Level floor. Excellent! The exquisitely designed hotel was built to accommodate for all 284 guest rooms to feature picturesque sea views. 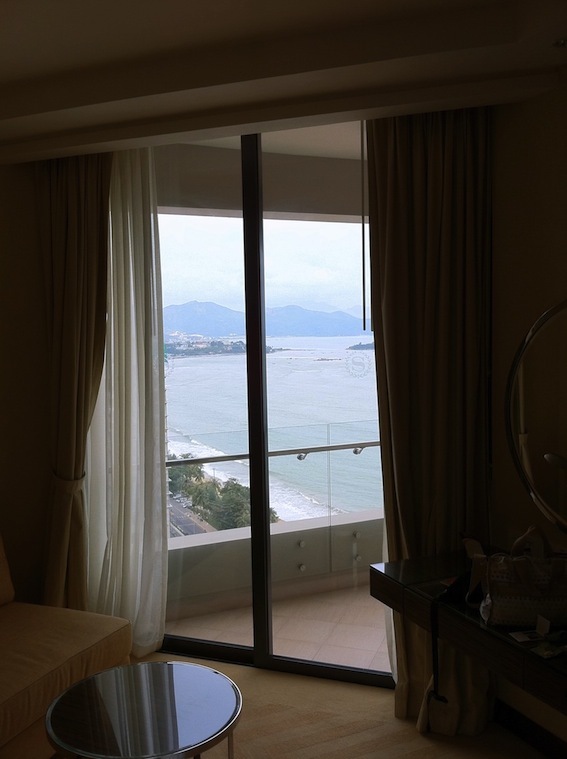 Our room had stunning sea and city views. (Views pictured above and on the left). 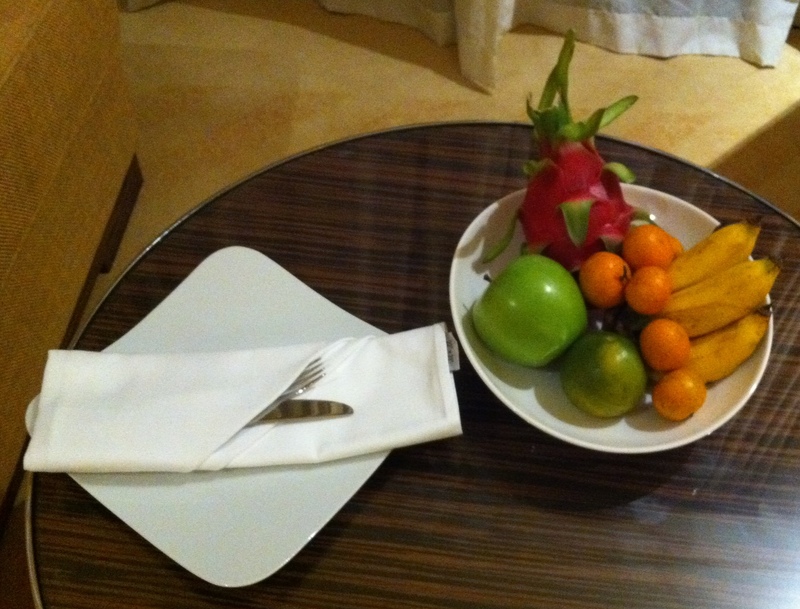 Local fruit and a lovely card wishing us a Happy New Year from the General Manager, were both waiting for us in our room. 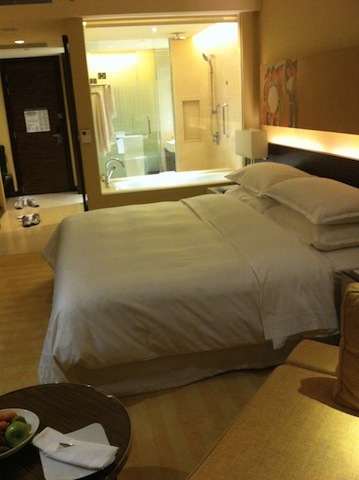 Our Club Level room, located on the 22nd floor, included an extra cozy king-size signature Sheraton Sweet Sleeper Bed. We didn’t want to get out of bed in the mornings because we were just so incredibly comfortable. The bathroom featured a walk-in rain shower and separate, large soaker bathtub. For increased privacy, its toilet stall was sectioned from the rest of the bathroom by a glass door. A nice perk about the room’s bathtub is you can enjoy a relaxing bubble bath and watch TV at the same time. Don’t worry, you can also have privacy while you bathe by rolling down the blinds. Luxurious bathrobes and slippers were provided for added comfort. Another nice touch was that 4 bottles of drinking water were provided, each day, so we didn’t have to go and purchase our own bottled water. What to do during your stay? Take a dip in their spectacular infinity pool, relax on their beach sun loungers (click here to see our Sheraton Nha Trang Beach & Infinity Pool post), or work out at their fitness center that offers a bay view while you run on the treadmill. Test your culinary skills at their cooking school located adjacent to their ping pong and billiards area. Dine in the hotel’s six inviting restaurants & bars. Enjoy an Indian Head Massage, get your hair and nails done, or immerse yourself in the large whirlpool, sauna or steam room, all provided at their Shine Spa. This hotel has so much to offer, some days we didn’t even leave the property! We, and our friends Elaine & Tom, took advantage of ‘inexpensive luxury’ as we called it – indulging in glorious room service, sipping cocktails by the pool, and partaking in a plethora of spa treatments. Hotel prices were a third of the price of comparable Sheraton services/products in North America. Another bonus for us, the Canadian Dollar was above par, making our purchases even cheaper. The icing on the cake? Our accommodation was free! Well, technically the room ‘cost’ us 7,000 Starwood points per night, but we had enough points saved up to cover our 5-day stay. (We used points + cash to enjoy a $45 USD per night room at the Sheraton Krabi Resort – stay tuned for that amazing resort review!) SPG is such a beneficial program, we’d definitely suggest it to frequent travelers. 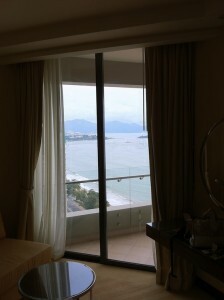 We’d also highly recommend staying at the Sheraton Nha Trang Hotel & Spa on your next trip to Vietnam.